« Squatchin’ with the daughter: Expedition 2, part 2 – The P/G Film Site! After our first epic Squatchin’ adventure, Maile and I couldn’t wait to get back to Bigfoot Country. 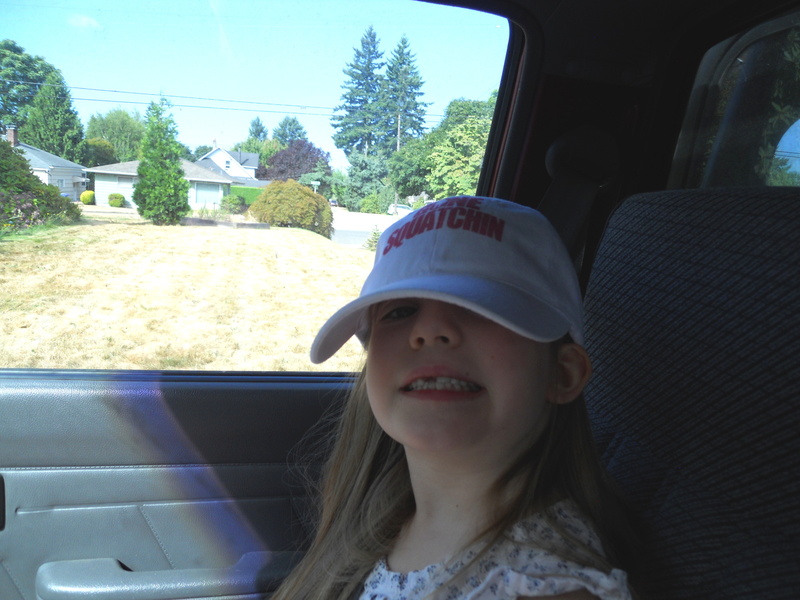 Late in August, as the dust was settling from her birthday revelries, we once again loaded up the truck and headed south. This time, however, we were much better prepared. Rather than camp near Orleans, we decided it would be a better idea to just head straight to Willow Creek, stay in the Bigfoot Motel for two nights, which put us right by all the food, gas and other supplies we would be needing. 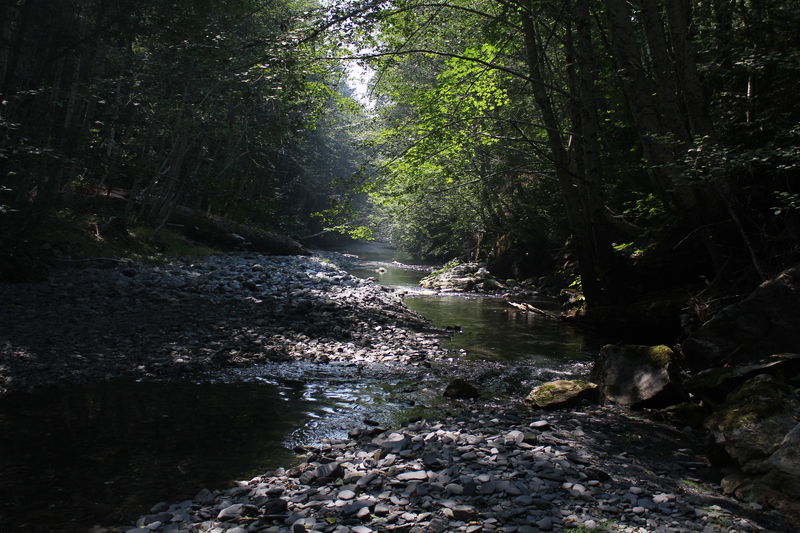 From there, we would launch our daily expeditions to the Patterson/Gimlin film site, and other areas of historical sasquatch importance along Bluff Creek. 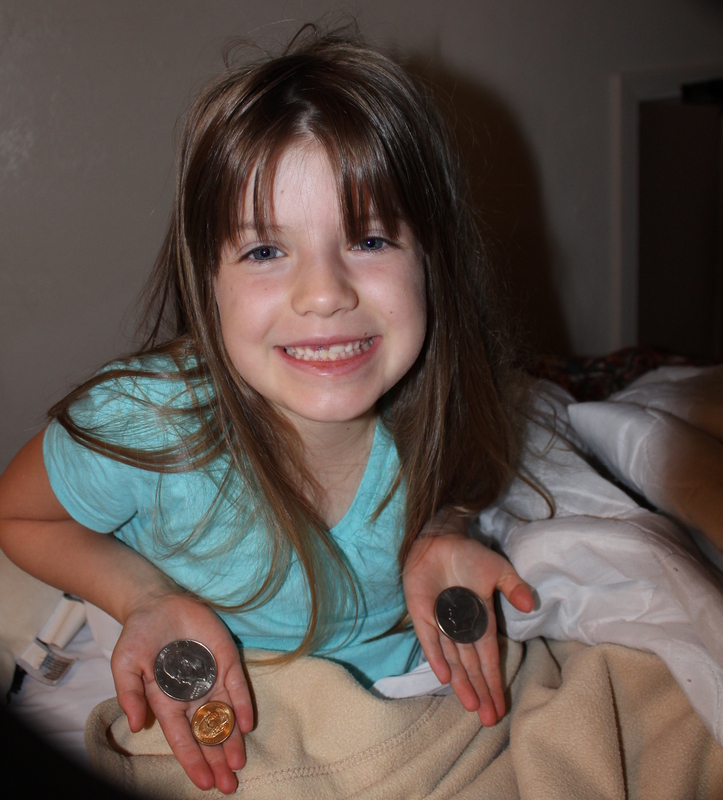 A Squatchin’ trip can’t fool the Tooth Fairy! Anyway, we slept in a little bit, and got rolling around 10:00. We drove back up highway 96 to Orleans, which was, by now, a very familiar stretch of scenic highway. Willow Creek to Orleans is around 40 miles, but the twisty nature of the Bigfoot Highway means it will take a good hour to make the journey. Just before Orleans is the turnoff to EyeSee road, which is also known as the G.O. 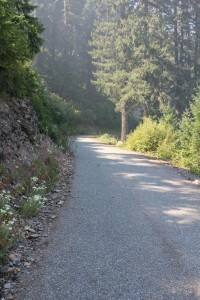 Road, or the “Go Road” The Go Road was originally built to connect the booming metropolises of Gasquet and Orleans; two towns separated by very rough mountainous terrain. I stopped the truck at the turnoff, got my camera out, slung it over my neck, then took off the lens cap. There would be some great opportunities for photography, and I didn’t want to miss any of of them, especially if they involved rapidly moving wildlife. I was getting pretty excited at this point, knowing we were finally getting into the very heart of Bigfoot territory. The Go Road is a relatively well maintained mountain pass, but gets snowed over every year around mid-fall. I’m told October may be too late in the year to count on being able to get through, but this time, August was just fine. 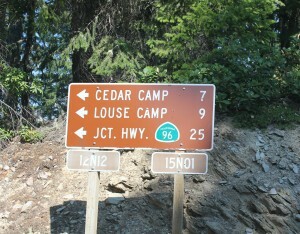 After a long and winding climb, we passed milepost 16, and started looking for the turnoff to Forest Service road 12n12. Just past MP 16 on the GO Road, the intersection with 12n12. The intersection isn’t exactly hidden, but it would also be pretty easy to blow by it without noticing. 12n12 was still paved, but this time it was only a single lane, with no shoulder. I’m not exactly sure how we might have negotiated a meetup with another vehicle coming the other direction. 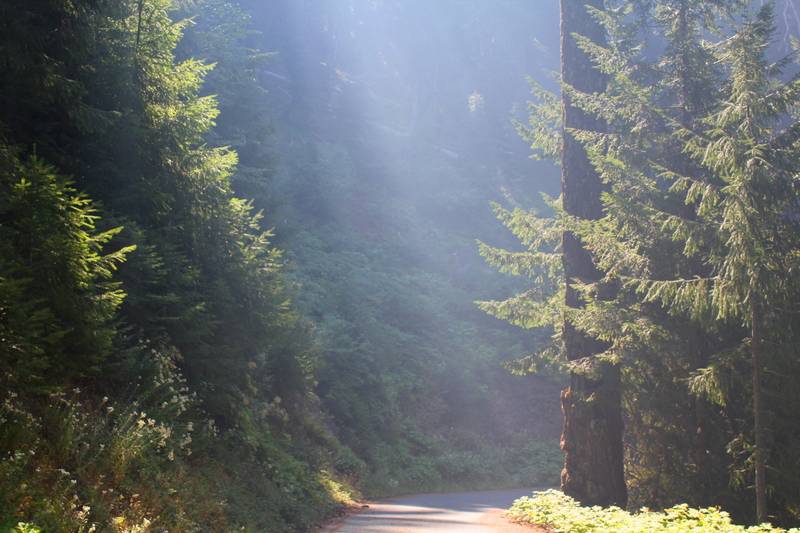 Luckily, in two days of driving around the woods, we saw exactly one other vehicle, a minivan driven by the NorCal version of a Soccer Mom bombing down the mountain at a speed that would only be dared by a local. Once on 12n12, we began to detect the unmistakable scent of wood smoke. Initially, I thought we might have driven by an unattended campfire, but as we continued, the scent grew quite a bit stronger. Eventually, we could see a haze of smoke as well. In a number of places, 12n12 affords majestic views of the forested slopes of the mountains below, and I could see that the source of the smoke was not immediately upwind or down-slope, so we pressed on. 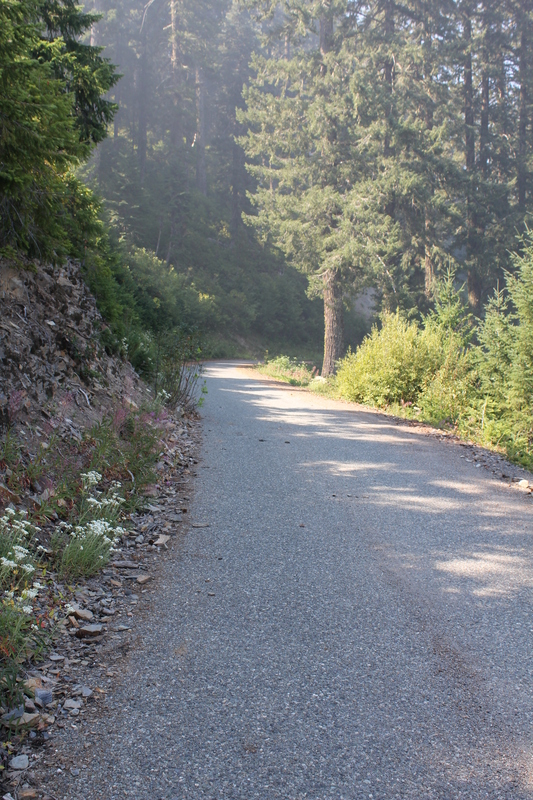 Forest Service road 12n12 is still paved, but a single lane. The haze of smoke thickened quite a bit, and over the next six miles, we were treated to some truly spectacular views of sun-beams slicing through the forest canopy. Being a remote mountain road, 12n12 is not fast in any sense, but as we rolled along with the windows down, despite our excitement to get where we were going, we felt no need to be in a hurry. Even with the smoke, which thickened, and then eventually abated, the crisp aromatic air left no doubt that we were far, far off the beaten track. Forest Road 12n12, sunny with smoke. 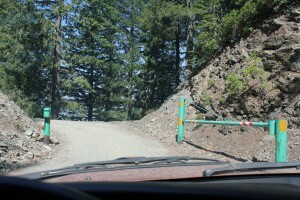 We finally arrived at the “Green Gate”, which opens into Forest Service road 12n13, known locally as the “Bigfoot Road”. This unpaved double-track descends down the side of the hill , eventually crossing Bluff Creek twice, and passing by the entrance to Louse Camp before looping back. I thought this would be an ideal time to lock the hubs on the truck and select a 4-wheel drive mode. That actually turned out to be a pretty good idea later on. As we descended down the steep side of the hill, it became readily apparent just how far out in the woods we really were. 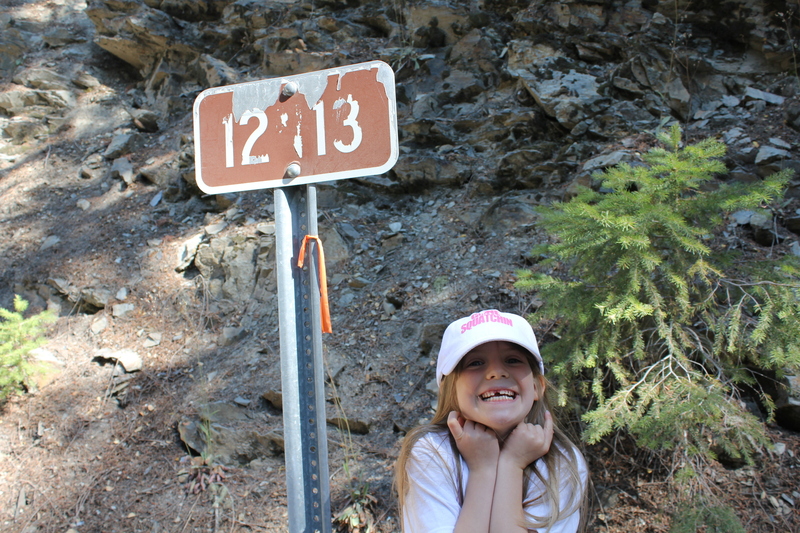 Maile looks pretty excited to be entering 12n13 – the Bigfoot Road! The Green Gate is just to her right in this photo. The forest canopy was quite dense, and the road got progressively rougher as we continued. 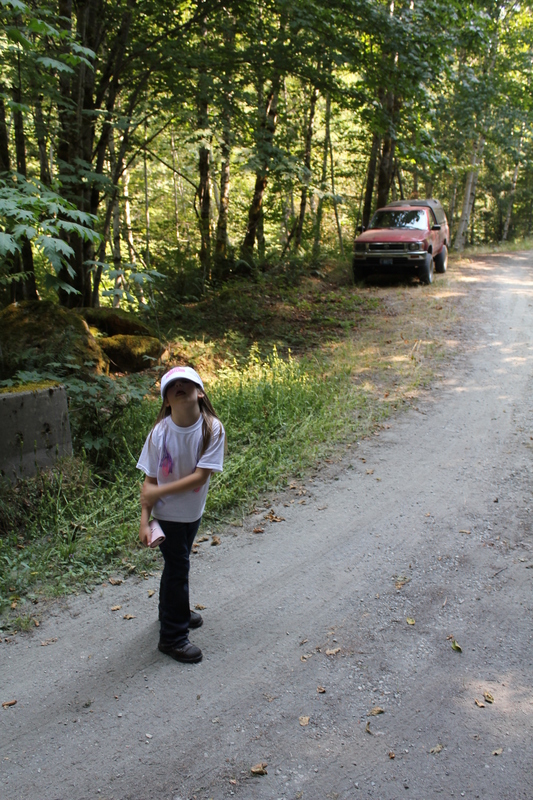 At the bottom of the hill, we reached the famous Bluff Creek Bridge. 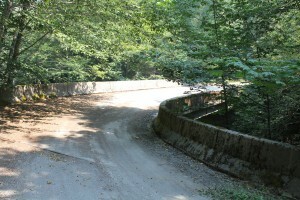 The bridge’s roadbed was paved, naturally, and the concrete K-rail made it look somewhat out of place in its modernity. 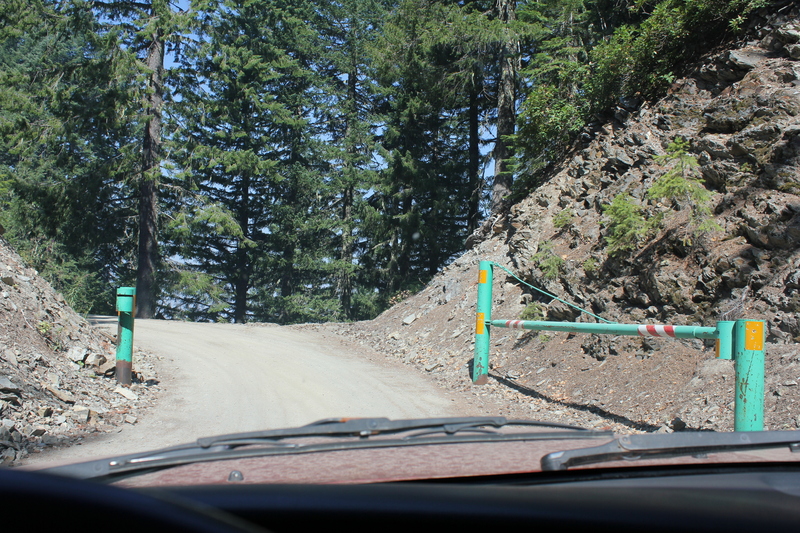 Through the Green Gate, onto Bigfoot Road, no more pavement! This is the “New” Bluff creek bridge. The concrete K-rail and the paved roadbed are the biggest signs of civilization for miles. It was a little reassuring, though, to know that we were still on an “official” road, and we had a good landmark. We decided this would be a good place to park the truck and take a look around. For the drive, we had just been wearing regular shoes, so we took a few minutes to lace up our boots. With the truck stopped, and both of us taking a well-needed stretch, the heavy quiet of the forest once again settled over us. We had been making no effort to stay silent, and our arrival by truck had certainly alerted any and all animals in the area to our presence, either by sound or the thick dusty contrail we’d been churning up behind us. That was fine with me, as the last thing I really wanted to do was sneak up on anything and give it a scare. Just in case, I made sure my lock blade knife was easily accessible. The bridge crosses Bluff Creek at a height of only about 10 feet or so, so it was a small little climb down to the creek itself. 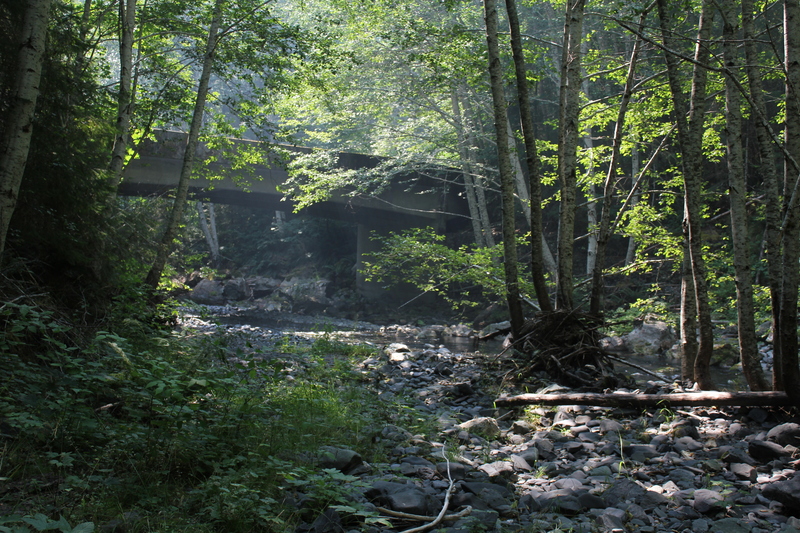 Since we still weren’t quite sure exactly where the film site would be from the bridge, we started upstream. 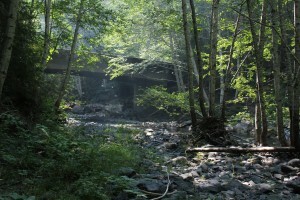 The Bluff Creek Bridge, as seen from the creek. In this image, we are looking downstream. At this point, I was feeling like we were “close enough” to the actual film site that we had obtained the bragging rights, so I was pretty much just enjoying the feeling of being in such a “Squatchy” neighborhood. That said, I was still keeping my eyes peeled for any of the familiar PG film landmarks, including the famous Bat Boxes, the “Big Tree”, or any of the various fallen trees and stumps seen in the film. None of that was apparent, but since it had been nearly 45 years since the film was made, I would expect very little would look the same. 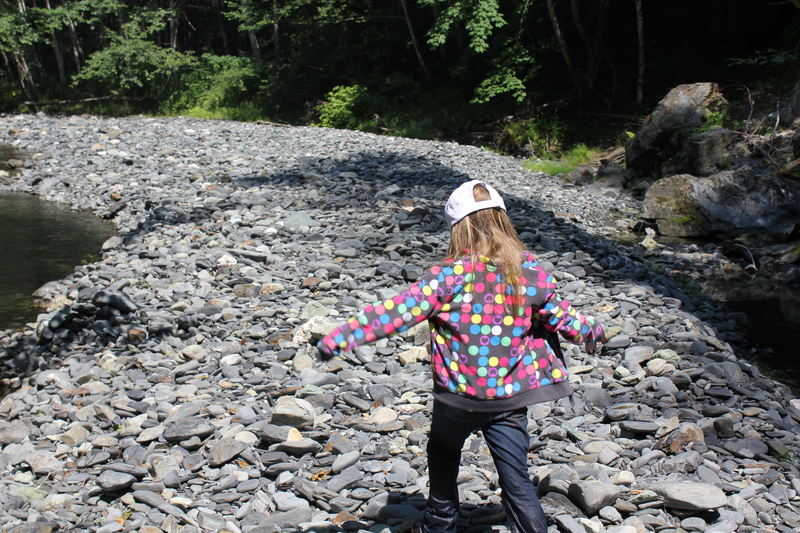 It wasn’t long before it became apparent that walking upstream would be difficult. After only a hundred yards or so, the brush got very thick, and at this point, we hadn’t yet figured out that we would be getting wet, and walking right through the middle of the creek. So we decided to turn downstream. At this point, we realized that if we were to get anywhere at all on this Bluff Creek adventure, we would need to be getting our socks wet. What the hell, we both had real live hiking boots on, so we finally just gave up and tromped through the water. This turned out to be just about the best decision we were to make on the entire trip. Bluff Creek is not all that deep, fast, or otherwise scary, so we didn’t even end up getting wet above the knees. As it was late August, and pleasantly warm, this really wasn’t a problem, although I would think about some more serious preparations if I were planning another trip later in the year (Hip waders would probably solve the problem entirely). So down the creek we hiked, just enjoying being in Bigfoot’s backyard. We kept our eyes peeled for anything that looked like it was Patterson and Gimlin’s film site, or, for that matter, anything that might one day become known as the Zenner/Zenner film site. Alas, we saw no evidence of any cryptids. 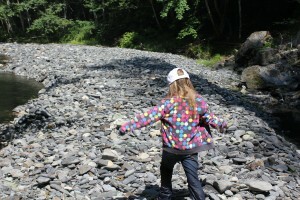 There are a number of large gravel bars in Bluff Creek. Here Maile walks along one of them. At times, the creek did get a little challenging. We climbed over some fallen logs, and more than once had to create a plan to get around small rapids, deep pools or short waterfalls. Most of the plans involved me either carrying Maile or assisting her in jumping over something. During all of this, I noticed something else that added to the mystique of Bluff Creek. Something that was quite interesting and just a little spooky: The rocky bottom of the creek creates dozens of little eddies and odd currents, which gives rise to an acoustic effect that is kind of like the familiar “babbling brook”. 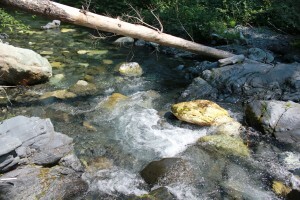 However, the effect as it occurs on this particular creek is much more pronounced (pun). It sounds remarkably similar to human vocalizations, as if you’re hearing a conversation, but can’t quite make out the words. Bluff Creek has lots of these little eddies all over the place. They make a sound that is eerily like a person speaking. There were a number of times where I actually looked around, expecting to see some other hikers. 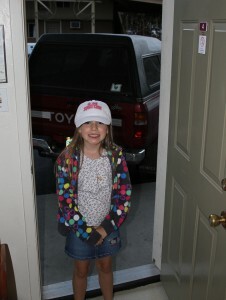 Of course, I never did, and since I was keeping an eagle eye on Maile, I knew it wasn’t her. 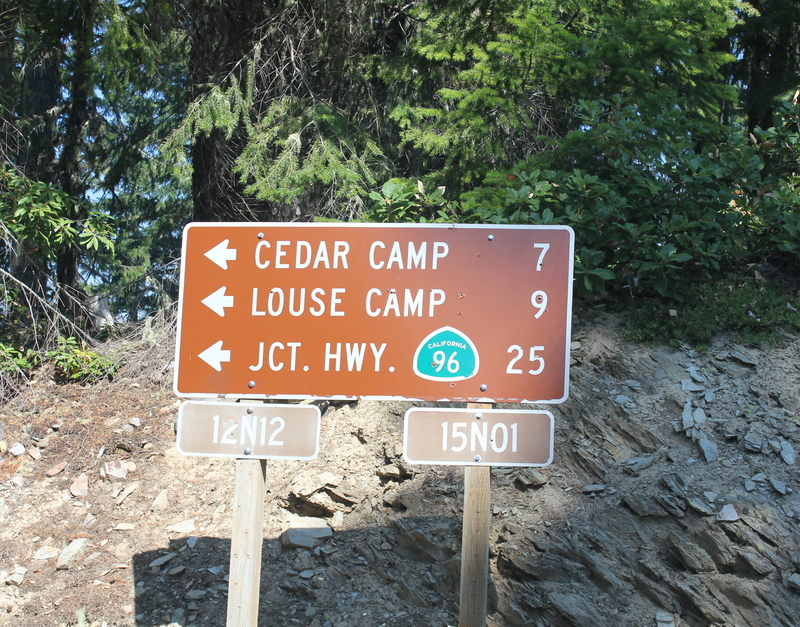 I can imagine how camping overnight at somewhere like nearby Louse Camp could be downright unnerving! We ended up hiking about a mile and a half, then decided it was time to turn back. We probably had some more in us, but we wanted to make it back to Willow Creek in time to visit Bigfoot Books before owner Steve Streufert closed for the evening. So we turned around and headed back to the truck. After our adventure near the Bluff Creek bridge, we return to the truck, soaked to the knees, tired, and feeling very good! The trip back was mostly uneventful. While walking along one of the many gravel bars in the creek, my footing gave way and I ended up falling rather gracelessly onto my elbow. I was mainly concerned about keeping grit out of my camera, but Maile seemed surprisingly shaken by the whole thing. I assured her I was okay, and we hiked the rest of the way out without further incident. By the time we got back to the bridge, we were feeling like we’d spent a good day hiking in the woods. We were just the right amount of tired and hungry. We had a snack of energy bars, water and pretzels, then started up the truck. We continued on in the same direction along 12n13, as I had the impression that the road would eventually loop back around. On the way, we came to a fork, and heading off to the left, we followed a road which was almost entirely overgrown, with the canopy above actually joining, forming a closed ceiling over the road. It was a little spooky, even during the bright of the afternoon. The road finally emptied into a campground equipped with a porta-john, a couple of fire rings, and a couple of picnic tables. I would find out later that this was the famous Louse Camp, where many of the original Bigfoot expeditions camped and planned their searches. Next time we come down, I want to spend some time here, and maybe, if we’re feeling brave enough, camp here for a night. We got back onto 12n13, where we crossed the “Old” Bluff Creek bridge, which can be identified by the legend “1958” pressed into the concrete of the bridge railing. We then headed back to Willow Creek. We made it to Bigfoot Books before closing, and ended up having another very interesting and entertaining conversation with Steve, and I ended up with another armful of books. I was also able to get some more specific directions that would end up taking us directly to the actual film site. Being a member of of a bookstore family, I feel it is very important to support small, independent stores whenever possible. Even if you can get the book for less money at Amazon or Barnes and Noble, there are plenty of reasons why independent booksellers are important parts of their communities. Okay, that’s it for the rant, except to say that if you should happen by Bigfoot Books in Willow Creek, please support Steve! After Bigfoot Books, we discovered that the Bigfoot Restaurant was open. On our previous adventure, we had managed to miss out on the place entirely. Since it was dinner time, and we had the opportunity, we stopped in. Maile liked her hamburger much better than her previous Willow Creek hamburger experiences, and the BF had some fascinating decor and atmosphere. We had found our new favorite restaurant in Willow Creek! We returned to the motel for more movies and, exhausted after our day of high adventure, passed out early. So ended day one of our second epic Squatching trip to Northern California. Day two was also a truly amazing adventure; Will we make it to the film site? Will we find any evidence of the creature? Stay tuned for those answers and more in part 2!